Gehry Partners, the architecture office of Frank Gehry, presented a snaking bench as part of Design Tide in Tokyo over the weekend. 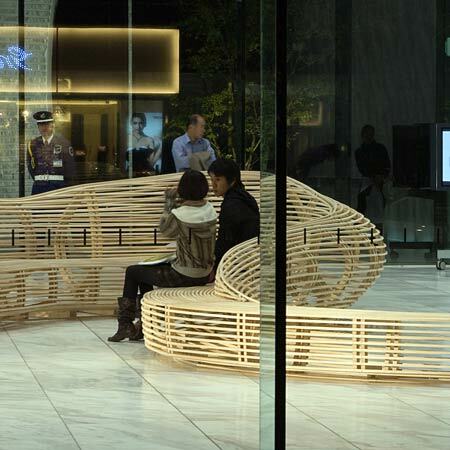 Called Tokyo Bench, the maple bench was installed in the lobby of World Co Aoyama Building. Design Tide is a series of exhibitions that took place in Tokyo form 30 October to 3 November, concurrently with Tokyo Designers Week. The bench was designed for World Co by Craig Webb and Claire Imatani of Gehry Partners and manufactured by Tomas Osinski Design Inc.